"The lens is designed to work both with cameras equipped with a matrix of full frame and APS-C matrix. Its optical structure is based on 14 elements in 12 groups optical. It was equipped with two type-ED lens and two hybrid aspherical elements and high-quality anti-reflection coating. Through such a lens solutions provide the highest quality imaging. The field of view for 35mm cameras with the matrix is 114 degrees, while the APS-C matrix is 92.5 degrees (in the case of cameras from Canon 89 degrees). Minimum focusing distance is 0.28 meters. Will be provided with bayonet systems from Canon, Nikon, Pentax, Sony. 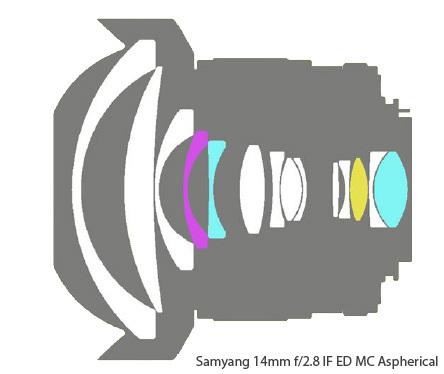 Release date in Poland is in November 2009, more information soon on www.samyang.pl Below is a diagram of construction of optical lens."